Vancouver, British Columbia–(Newsfile Corp. – February 4, 2019) – Jaxon Mining Inc. (TSXV: JAX) (FSE: OU31) (OTC: JXMNF) (“Jaxon” or the “Company”) is pleased to announce additional high grade gold mineralization discoveries of up to 55.26 g/t gold equivalent which includes 40.41 g/t gold, 6.77% copper, 110 g/t silver, 1.29% bismuth and 0.02% cobalt from its 2018 surface sampling and geological mapping program at the Red Springs Project and determines the low angle thrust fault bounded sill-like gold-bearing quartz tourmaline breccia mineralized zone extends over 1 km2. Jaxon’s conceptual geological model indicates this large brecciated zone is distal to and was generated by Red Springs’ porphyry system. 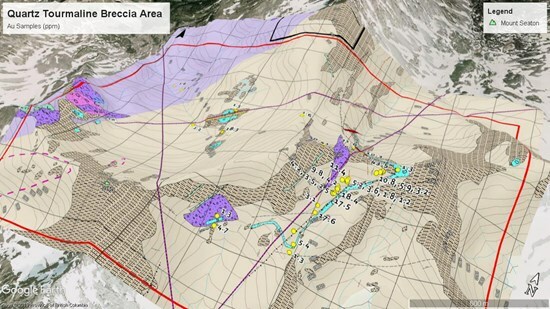 This system is indicated to be a large porphyry system by the presence of the large hydrothermal brecciated zone, strong IP anomalies and the sampling and mapping work completed in 2018. A total of 42 additional surface outcrop grab or chip samples have been collected from the field within tourmaline breccia zones/veins area (Figure 1) at the Red Springs Project. Assay results show high grade gold of up to 43.50 g/t, high grade copper of up to 8.33%, high grade silver of up to 846 g/t, high grade cobalt of up to 0.37% and high-grade bismuth of up to 1.29%, respectively (Table 1). All three of the highest-grade gold (>1 ounce per tonne) samples (A0020152, A0020661 and 719782) were collected in the North extension part of the Backbone tourmaline breccia zone in North Cirque, in the direction of one porphyry intrusion. The average grades from the total 42 surface samples are 11.20 g/t gold equivalent with 7.81 g/t gold, 54.38 g/t silver, 0.06% cobalt, 0.61 % copper and 0.18% bismuth. Significant assay results are highlighted in Table 1. The assay results confirm the existence of a low angle thrust fault bounded sill-like high-grade gold bearing tourmaline breccia mineralization mat with silver, copper, cobalt and bismuth credits at Red Springs. 1EqAu is calculated using long term prices for gold at $1250 USD per ounce, silver at $20 USD per ounce, cobalt at $60K USD per tonne, copper at $6K USD per tonne and bismuth at $10K USD per tonne. Surface geological mapping (Figure 1) from the 2018 field program confirms the gold-bearing quartz tourmaline breccia zones or veins distribute from the Backbone tourmaline breccia zone at East longitude 612100 to West Cirque at longitude 610500 (approximately 1600 m wide) and North West Cirque at coordinates of longitude 611100 and latitude 6113800, which covers over 1 km2area. The outcrop of tourmaline breccia at the Backbone zone extends over a strike length of 1000 m to North Cirque and is up to 15 to 50 m wide on surface outcrops. Gold grades from surface channel samples are up to 25.86 g/t gold, with cobalt and copper grades up to 0.05% and 1.34 %, respectively. The Backbone tourmaline breccia zone extends to the West at a dip angle of approximately 15 to 17 degrees, confirmed by the outcrops of the tourmaline breccia zone along the contour lines at the South end of the Backbone tourmaline breccia zone (Figure 2) and drilling holes BB18-04 and BB18-04 at the Backbone zone area (Figure 3). The outcrops of multiple short tourmaline breccia veins at both West Cirque and North West Cirque may represent the top part of tourmaline stringers derived from the thick tourmaline breccia mineralization zone at depth which extends from the Backbone tourmaline breccia zone along the dip direction (Figure 2-3). The tourmaline breccia zone (or pipe) depth may extend down to 300 m to 400 m deep which is also indicated by the strong IP anomaly (Figure 4) at the depth in the North West Cirque and West Cirque areas. Prospecting samples were collected in the field by experienced, professional prospectors and geological staff who selected hand samples from outcrop, chip samples, boulder and talus debris samples suitable for slabbing by rock saw. The samples were numbered, described and located in the field for follow-up. Numbered rock samples tags were placed inside each bag which were securely closed for transport to Jaxon’s secure cold storage locked facility in Smithers, B.C. Representative sample slabs were cut from large specimens and halved rock samples so that portions of select samples could be saved for the Company’s rock library, descriptive purposes and petrographic study. MS Analytical of Langley, B.C. received the Rice Bag shipments after secure transport from Smithers. They prepared the samples by crushing, grinding and pulverizing to a pulp with barren material washing between each sample at the crush and pulverizing stages. Then 20 g of pulp was used for the (IMS-117 code) ultra-trace level ICP/MS AR digestion method, and four acid 0.2 g ore grade ICP – AES method (ICP-240) and for the over limit gold the FAS-415 method of 30 g fusion Gravimetric method was used to report gold ASSAYS. Over limit silver is determined by Fire ASSAY 415 method. Laboratory standards and QA – QC is monitored by Jaxon. Tourmaline-sulfide breccia zones and veins have been widely found in the Backbone, North Cirque and North West Cirque prospects. At Backbone, breccia mineralization extends over a strike length of 1000 m and is up to 15 to 50 m wide on surface (Figure 5). Gold grades from surface channel samples range from 1 g/t to 32 g/t Au, with cobalt and copper grades up to 0.36% and 8.33 %, respectively. The 2018 drilling program confirmed the continuity of mineralization over a strike length of 300 m from BB18-01/02 to BB18-03/04/05 and low angle (<30 degree) dip extent of over 100 m from surface channels to the West (Figure 1). 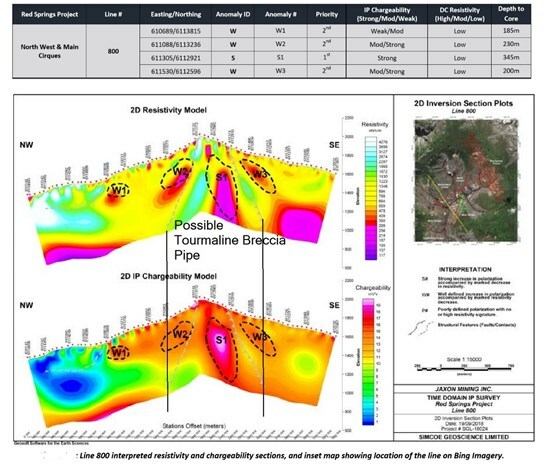 Mineralized tourmaline-sulfide breccia zones in drill core extend discontinuously over lengths of more than 26 m at a gold equivalent grade of 1.44 g/t in BB18-03 at the down hole depth from 67 m to 93 m, 20 m at a gold equivalent grade of 0.53 g/t in BB18-04 at the down hole depth from 64 m to 84 m and 21 m at a gold equivalent grade of 0.58 g/t in BB18-05 at the down hole depth from 66 m to 87 m. The assay results also confirm a 2 to 3 m wide high-grade band existing under the hanging wall within approximately a 20 m wide mineralization zone with a gold equivalent grade from 2.40 g/t to 15.0 g/t at the Backbone tourmaline breccia zone. Based on the 2018 IP survey and drilling program, the Company has identified multiple high priority IP anomalies for sulfide mineralization. 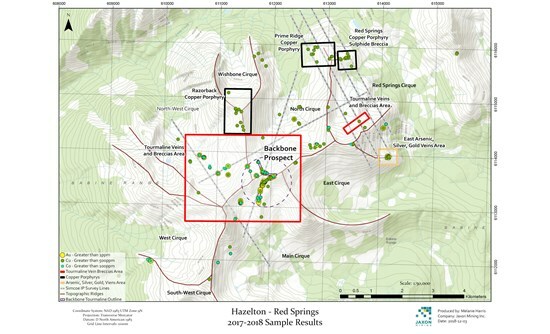 High priority IP anomalies extend from the Backbone to North Cirque and North West Cirque areas and cover a 1 km2 area at depths ranging from 350 m to 430 m. The IP survey also indicates the existence of a system of porphyritic anomalies located at the Red Springs Project area. Deeper drilling into these high priority IP anomalies is being planned for spring and summer of 2019. Jaxon invites everyone to visit booth number 3007 at PDAC in Toronto, from March 3 to 6, to examine the core and learn more about the Red Springs Project. This news release may contain forward-looking information, which is not comprised of historical facts. Forward-looking information involves risks, uncertainties and other factors that could cause actual events, results, performance, prospects and opportunities to differ materially from those expressed or implied by such forward-looking information. Forward-looking information in this news release may include, but is not limited to, the Company’s objectives, goals or future plans. Factors that could cause actual results to differ materially from such forward-looking information include, but are not limited to, those risks set out in the Company’s public documents filed on SEDAR. Although the Company believes that the assumptions and factors used in preparing the forward-looking information in this news release are reasonable, undue reliance should not be placed on such information, which only applies as of the date of this news release, and no assurance can be given that such events will occur in the disclosed time frames, or at all. The Company disclaims any intention or obligation to update or revise any forward-looking information, whether as a result of new information, future events or otherwise, other than as required by law. Neither TSX Venture exchange nor its Regulations Services Provider (as that term is defined in the policies of the TSX Venture Exchange) accepts responsibility for the adequacy or accuracy of this release. 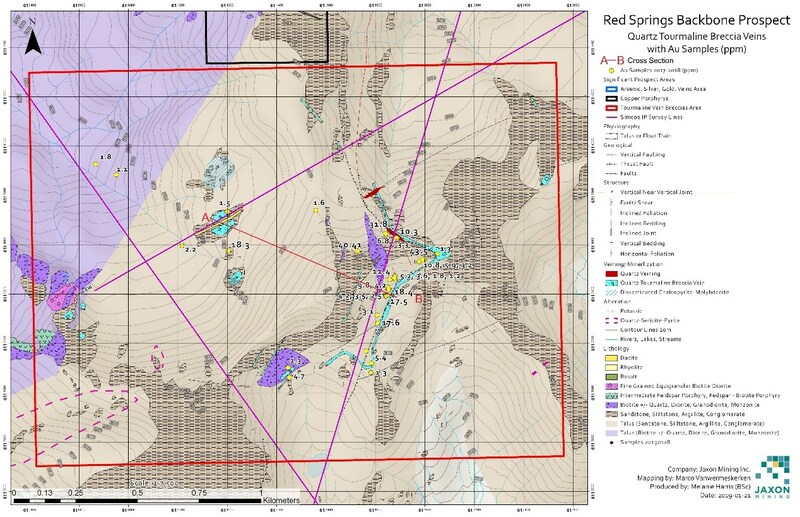 Disclaimer: This is an unedited and minimally reviewed public mining company press release originally published at http://www.newsfilecorp.com/release/42626/Red-Springs-Project-Update-Jaxon-Discovers-Additional-HighGrade-Gold-Mineralization-in-North-Cirque-Determines-Low-Angle-Thrust-Fault-Bounded-Quartz-Tourmaline-Breccia-Minerlization-Zone-Extends-over-1-Km2. We have linked to our knowledge base articles from within the content of this release in order to help explain some of the terminology used and provide continuity from previous and related news coverage. You can access more in-depth mining company project reviews on our site, as well a knowledge base of articles on mineral exploration, mining and geology-related topics.